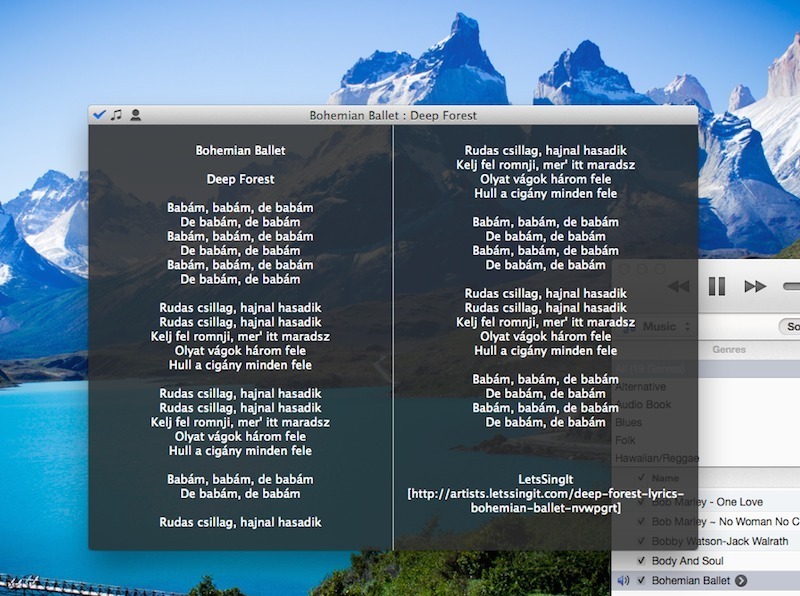 Automatic lyric search for iTunes and Deezer. Is there a better alternative to Singer Song Reader? Is Singer Song Reader really the best app in Music category? Will Singer Song Reader work good on macOS 10.13.4? Singer Song Reader allows you to search and save lyrics for the song currently being played or all the songs selected on iTunes. Deezer is also supported. Searches 16 lyrics sites in one shot, including Anime/Japanese sites. Identifies incomplete lyrics due to a lack of license and removes them from the search result. Identifies Japanese Romaji and Kanji scripts so you can choose one of them. Safe - Existing lyrics are not replaced. Sites updated: Half of the already supported sites. One key shortcut - Up/Down arrow keys to change iTunes tracks and Left/Right arrow keys to switch site tab (Can be enabled in the Control menu). Multi-column layout so you do not have to scroll up and down. Three appearances - Full, minimum, and panel.